The Katerina Trilogy — (2012-2013) Publisher: St. Petersburg, Russia, 1888. As she attends a whirl of glittering balls, royal debutante Katerina Alexandrovna, Duchess of Oldenburg, tries to hide a dark secret: she can raise the dead. No one knows. Not her family. Not the girls at her finishing school. Not the tsar or anyone in her aristocratic circle. Katerina considers her talent a curse, not a gift. But when she uses her special skill to protect a member of the Imperial Family, she finds herself caught in a web of intrigue. An evil presence is growing within Europe’s royal bloodlines — and those aligned with the darkness threaten to topple the tsar. Suddenly Katerina’s strength as a necromancer attracts attention from unwelcome sources… including two young men — George Alexandrovich, the tsar’s standoffish middle son, who needs Katerina’s help to safeguard Russia, even if he’s repelled by her secret, and the dashing Prince Danilo, heir to the throne of Montenegro, to whom Katerina feels inexplicably drawn. The time has come for Katerina to embrace her power, but which side will she choose — and to whom will she give her heart? 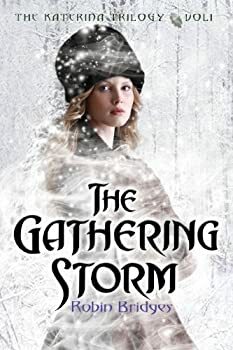 The Gathering Storm is the first in the KATERINA TRILOGY by Robin Bridges. 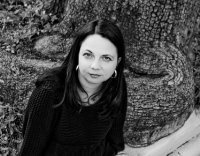 The trilogy blends historical fiction with the paranormal, and is set in St. Petersburg, Russia, in the late 19th century. Bridges immerses us in an evocative setting. The pageantry of the Russian court is combined with that hard-to-describe fairy tale mood. Even though we see through the eyes of a heroine who doesn’t really like all the pageantry, we are swept away into a world that is elegant but filled with dark secrets.